This movie is truly delightful. And Will Ferrell is the reason why. He fills this movie with a contagious, child-like enthusiasm (that he calls "Christmas Spirit") that is so endearing that even a Scrooge couldn't help but smile and laugh their way through the entire length of the movie. The story is simple, yet heart-warming and fun. One year when Santa is visiting an orphanage on Christmas Eve, a baby crawls its way into Santa's sack. When Santa returns to the North Pole, the Elves decide to adopt him and raise him as one of their own. 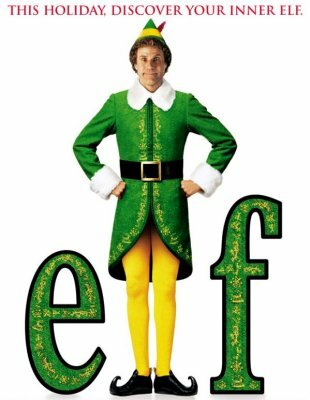 He is named Buddy and is adopted by Papa Elf (Bob Newhart, who also begins and ends the film as the narrator). When Buddy grows up and realizes that he is "different" he decides to leave the North Pole in search of his biological father, Walter (James Caan), who of course is a Scrooge-like character living in New York City. Throughout the film, Buddy seems out of place. When at the North Pole, it is not only his size but his clumsiness which ostracizes him from the other elves. And, needless to say, Buddy's "Christmas Spirit" is a bit out of place in New York City, which provides for much of the film's hilarity. Not to mention the fact that almost the entire time Ferrell is dressed as an Elf...tights and all. However, somehow the movie gets us to love him rather than just laugh at him, and we realize that the world would be a better place if we would all be a little more like Buddy instead of Buddy being more like us. There are several supporting characters in this movie who prove this notion to be true. Whether it be his father, Walter, or his stepmother Emily, or his brother Michael, or his love interest Jovie (Zooey Deschanel - who is hot, by the way), everyone is not only touched, but changed for the better after having met Buddy the Elf. A huge praise of mine for this movie is the fact that while it might get a bit crude at times (burping, etc), it still retains its innocence and doesn't stoop to inappropriate vulgarity or innuendo. Thus, I had absolutely no problem taking my eight-year-old daughter to see it (this contrasts with The Cat in the Hat which, while it didn't scar my daughter for life, definitely had a raunchier feel to it as well as several scenes which I would have preferred that she not see). 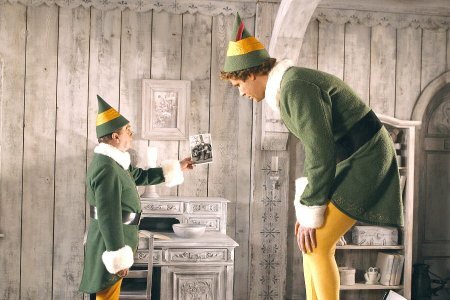 While my favorite Christmas movie is still Christmas Vacation, I'd have to say that Elf has just become another instant Christmas classic which we'll probably be watching in my home each December for years to come. Elf is Entertaining, Loveable, and Fun. How would you rate the movie Elf? There have been 42781 people to visit this page since Fri, Nov 14, 2003. And you are the first person to visit this page today!